The Gilbert Street bridge ran north to south from the south end of Gilbert Street in Danville across the river to S. Main Street in S. Danville. It was built in 1893, originally for wagon traffic. 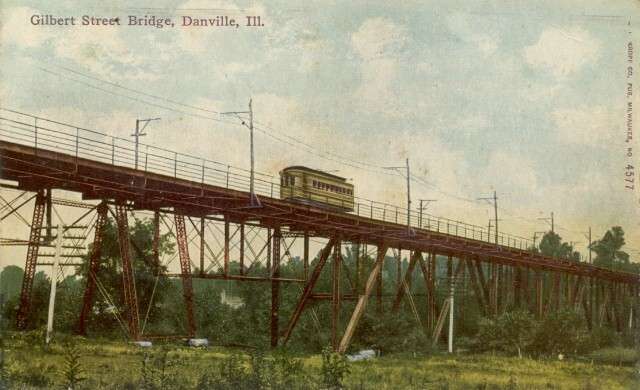 When the lines to the southern suburban towns were built, tracks were added to this bridge. It appears from this picture to have been a double track line (note the double row of power poles on the bridge). There is also a line of whitewashed poles, probably carrying telephone or telegraph wires, down in the valley. Eventually, trolley traffic was removed from this bridge, and the ITS erected a bridge running diagonally from S. Vermilion Street to S. Main Street (see the next pictures). The Gilbert Street bridge was replaced about 1921, but the new bridge did not carry trolleys. — Kropf Co.